IT’S DAY 152, AND KAIDIE CERTAINLY HAS MUCH CATCHING UP TO DO. In the midst of trying to make sense of Nondon now/here. Hello world. Again. I’ve run back to run my own lives. For now. For the benefit of those of you who have just joined me on my quest, here’s a summary of the events in March and April: On 2 March, while running along Fuston Road, I fell head-over-heals. I dislocated a part of my body. Thereafter, I could not be located. I had been kidnapped by The Good Pirate into the world-within-world-within-world of Phuket 2.0 in Second Life. In my absence, a reader, Kailives, hacked into my account and ran my lives on my behalf, by maintaining this blog, my Facebook Twitter and Youtube pages, as well as standing in for a few of my gigs. I did make brief appearances in some of these events, and that was how my whereabouts was uncovered. Finally, on my 5th-month birthday, I decided to break free from my kidnapper, and left the metaverse.For better or for worse, but for a restless runner, it is certainly not for good. Kailives did try her best to do my job in my absence. 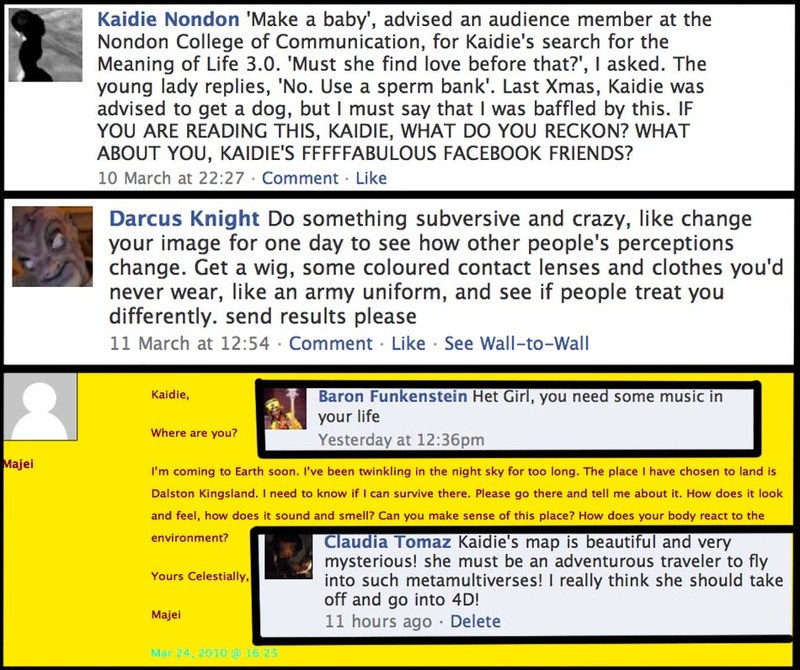 However, in this collaborative quest of the meaning of Life 3.0 of Kaidie’s, there were several issues that her co-runners raised that made Kaidie slightly dumbfounded. Some of them are reproduced in the above image. In the coming weeks and months, I will have to try to think about them and respond to them. So, my dear readers and fellow-runners, thank you very much indeed for all your advice and support so far. Please do be patient and give me some time to carefully look at your advice. Kailives has left, but if need be, I may get her back, if I need her voice. At this point, however, I can respond loud and clear, in absolutely no uncertain terms, that I will have to say no to the suggestion that Kaidie should make a baby in her quest for the meaning of Life 3.0. Kaidie’s response is NO, no, no thank you, never. No. Kaidie will make no baby. Especially not now, given the way things seem to be heading in Nondon. This entry was posted on Friday, May 14th, 2010 at 09:00	and is filed under REALITY CHECK and tagged with between life & death, chaosmos, cycles, existence, life 3.0, web 2.0. You can follow any responses to this entry through the RSS 2.0 feed. You can leave a response, or trackback from your own site.